One of my primary objectives of the trip was to revisit Bandung, the city my family had once called home. Upon arriving however, my curiosity directed me towards a neighboring town where things had been decidedly less pleasant. 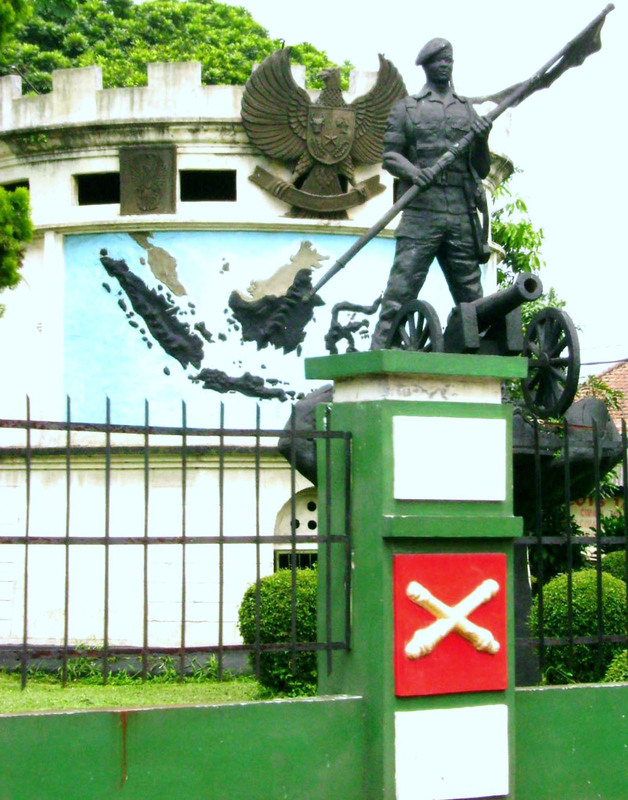 It’s primarily a garrison town once used by the Dutch and now by the Indonesian army. During WWII the area was taken over by the Japanese and used as a POW camp. It was here that my Opa, and many other men were imprisoned. The old POW camp remains and is still in use as a prison today. The structure was built-in 1886 and is looking pretty good for its age. If you were an occupant you may see things differently though. The guards out front were friendly. I can’t imagine they get a lot of camera wielding tourists coming by for a snap shot so a break in the routine was a novelty I’m sure. Unfortunately I was told pretty smartly that photos of the entrance are not allowed so the one you see was taken as we drove away. For me, seeing the building and being able to fix a location to a situation Opa had found himself in was good enough. I did the same thing a number of years ago when I visited Strujswijk Prison (now Salemba) which is also still in use in Jakarta. The town has a lot of Dutch buildings and driving around you get to see many. Churches, hospitals, houses, and office buildings, all of which add a little more insight to this era. I didn’t spend a long time here in Tjimahi but long enough to be able to reflect and imagine. I realized a long time ago that being able to really use your imagination when focusing on history provides a foundation for an emotional experience, whether you’re talking Roman Forum or personal heritage. On return to Bandung I went to Bimaweg. Back in 2004 I visited the home of my mother’s family here. It was a great experience. I decided to return on this trip and see how much had changed, if at all. I was a little hesitant because my experience first time round had been so good. The new owners had invited me in for a look around and then extended an invitation for dinner that night, which I accepted. The evening could not have been more perfect. They gave me a tour of the house, told me what they could of its history, looked with interest at the old black and white photos of the house I had with me, and then they fed me a gorgeous meal. This time it was more of a reconnaissance mission. Bimaweg (now Jalan Bima) was unchanged. A little busier and a couple of newer buildings but it remains much like I remembered. My mother and her family grew up in this house and lived here for many years. They attended nearby primary schools, held birthday parties on the roadside, and had bread delivered by horse-drawn carts. I mention the latter because while I was there the modern version of the horse and cart drove by. Returning to this street where my family have a significant history definitely puts the imagination into overdrive. Both Jakarta and Bandung, even though changing, have retained a lot of the Dutch residential areas. The streets are still there and most importantly, so is the spirit. For photos of Indonesia click here. Hi Tim, I just came across this post & love this, it’s fascinating. My family is Chinese-Indonesian & we’re from Bandung on my mom’s side of the family. My home is at Jalan Sadewa, across the street from Jalan Bima. I called my grandparents Oma & Opa, still call my aunts & uncles Tante and Oom, and my mom & her sisters still speak a bit of Dutch. I went to junior & senior high school at St. Aloysius, the “broeder” school mentioned by Vera Hager, now a co-ed school still run by the Catholic church. My favorite old-school bakery is Het Snoephuis (now called Sumber Hidangan) which has been in business since 1929 at Jalan Braga. We have similar black & white photos and I love learning about the stories behind the pictures. I have to admit that unfortunately we did not learn a lot about Bersiap and the Dutch intern camps during history class at school, the focus was primarily on the Indonesian side of the struggle for independence. Resources like your blog and Simon Winchester’s Krakatoa book help me see a more complete picture of the past. Very cool also to read about your adventures in other parts of the world! Glad you found me Rosa. I have a lot of stories from travels through Indonesia and some that involve my family history as they grew up and lived in Indonesia during some turbulent times. Interesting, but not unusual, that you were taught only the Indonesian struggle. Rarely is the struggle of the colonizer mentioned in the history of the colonized…understandable. I’ll definitely read the other stories, thanks Tim! 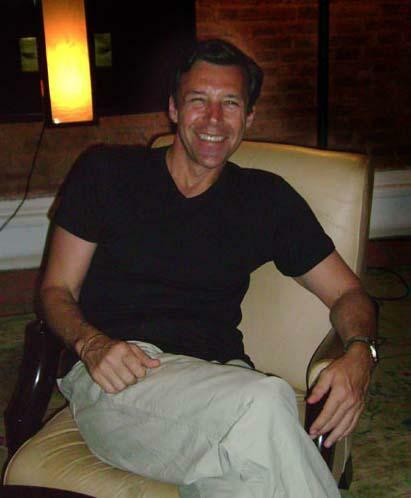 Hi Tim, Delighted to read about your visit to Bandung. My five oldest children were born in Bandung. Would love to go back and visit the “Broeder school”. My husband was a teacher there. Thanks for sharing. As you know my mother grew up there so the city holds a special place in my heart. What great history to go back to and the hospitality you received. I know sometimes visiting a place you called home can be bitter sweet. Thank you for sharing and the pictures are very nice. Really touching to see you go back to your parents’ old haunts. Interesting to see how far the Dutch spread throughout Asia back then. I noticed that in parts of Malaysia as well and it seems inevitable that almost anywhere you visit in Asia has some sort of dealings with Imperial Japan. I might be somewhat biased living in Korea but it always seems worth a mention no matter where you’re talking about. Lovely post about going down memory lane. Must have been hard looking at the prison building and thinking about the time you grandfather was imprisoned there. I’m sure it was such a heartening experience to go back where your family has such history, even if all the history may not have been happy. I think it feels good just to remember. I grew up in 8 different homes as a child. I would love to knock on the door of some of those homes and see what it has become since I have left. The kindness I was shown was not expected; at least not at the level they provided. I was made to feel very welcome. Pictures really are worth a thousand words. Your photos are amazing! I love the photos and how they compare how the area looked then and now. How amazing that you got to visit a place that is rich with your mother’s memories. I can imagine how special that must feel. Definitely a trip to cherish! What a great gift, to be able to return to the places your family lived. The saying, “you can’t go home again” is true, but there’s something profound in being able to visit and imagine your parents’ history. I love what you said about using your imagination to “see” a place in the past. I like the mix of new and old photographs in this post. It must have an interesting and emotional experience to explore a place with such a personal history for you. Very emotional but am also very happy to have been able to do this. Hi Tim, I really enjoyed this post. It must be so interesting, and a little surreal to visit all these places where your family once were. It is great that you are preserving your family history in this way. I especially love the old photographs! It is interesting and surreal for sure; really kicks the imagination and emotions into high gear. Glad you enjoyed the post. Many a time I have had thoughts of going back to the place where I grew up and just see how much it has changed. I even imagined my old neighborhood as I read your post. I would say you are blessed to have had such an opportunity and its priceless. Going back can be a double edged sword. One side emotionally fulfilling opening the door to more questions than answers. On the other side heart-ache and disappointment. I have had both but in this case it was most definitely the former. How cool to see you retracing such footsteps. I once transcribed a makeshift diary my grandpa kept when he was a POW on the German Death March in WWII, but he would never talk about the experience. I was more than thankful he let me keep the diary when he passed away along with his war medals. It meant a lot to him that I typed it up and did the research, but he never told me so even though his actions did. My Mum was the same way. She was very proud that I was interested and researched the era; made me even more determined to understand as much as possible. Besides, it is fascinating. I enjoy the nostalgia of your old black and white family photos. Bread delivered by horses, I wonder if there’s somewhere that still does that? Thank you for sharing. Hi Tim – I don’t know if you are aware that I am dutch and now am called Oma by our grandchildren, so I totally loved it when you referred to Opa – It must have been quite something to stand outside the prison where your Opa spent time. Wonderful that the people who now own the home where your mother grew up were such friendly outgoing people and willing to share with you, that must have been quite an emotional experience for you. Truly enjoy your posts and photos. I didn’t know you are Dutch Lenie but now that you mention it the name fits 🙂 Mum was born in Oosterbeek just outside of Arnhem and I have tracked her and the family history from there to the Dutch East Indies and onward. A remarkable story from a very unique time. One of the most emotional experiences of my life. Both cities have certainly changed a lot over the years; Jakarta especially and not always in such a good way. It was a decade ago that I truly became fascinated by my family heritage and since become the keeper of records in my family. There is a lot to be learned from what went on before us. Thanks as always Jacquie. It’s really special to visit places that has a connection with your ancestors, isn’t it. When I lived in London my brother showed my the office daddy used to work out of and a pub he used to frequent. When I was in Lisbon someone at the ministry of foreign affairs asked if I was related to daddy. Loved it. Sometimes the world really is a small place. I like the history of this article. The photos are awesome; I really like the picture of that old motorcycle. Thanks for sharing that with us. That is one of my favorite pictures of that era so glad you liked it. How wonderful to visit the places of significance in your family’s history. I love that you took a photo of the prison’s entrance as you were driving away, something I probably would do as well. Hey Tim, another set of great personal insights and I love the photos, particularly the old black and whites. Glad you were able to honor your Opa and that the return visit lived up to hopes as it is not always the case. It is fascinating to see what, from the old colonial days, still remains in Asia and how on some level there is affection for certain aspects of it among some of the locals so long after giving us the boot. Fascinating and what an experience to go back to where your Opa was imprisoned near Bandung. I love looking at historical photos like this when there is a story behind them. Reminds me a bit of when my parents went to Auschiwtz and Dachua where my father’s family perished during WWII. Depressing, sad but necessary to always remember. Thanks for sharing this piece of history and personal story with us. It was certainly an amazing experience. I have spent years researching and visiting places that are important to my family history and have many bitter-sweet stories to share. It’s often bitter sweet when we return to a place we called home after being gone. My husband and I once visited a prison in Turkey and it was the same policy; no photos. You did pretty well with all your photos!